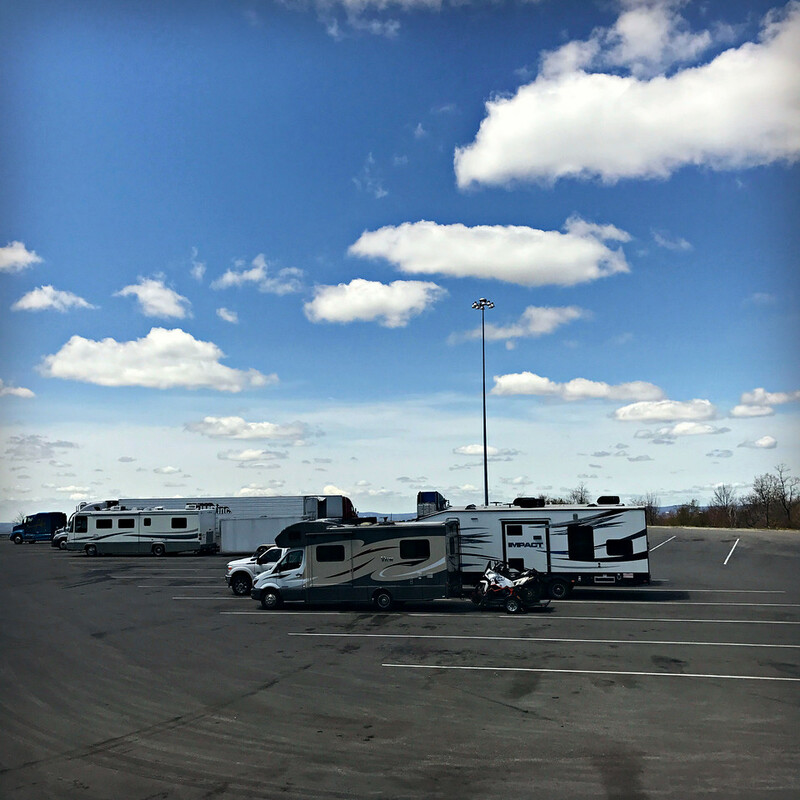 While I was walking the dog on a grassy knoll at a West Virginia highway rest area, the Harvey seemed so tiny compared to our friend’s pickup and toy hauler behind it. But when you’re driving the RV and tugging the trailer along a winding mountain road, it doesn’t feel quite so tiny. It’s all about your perspective, I s’pose. 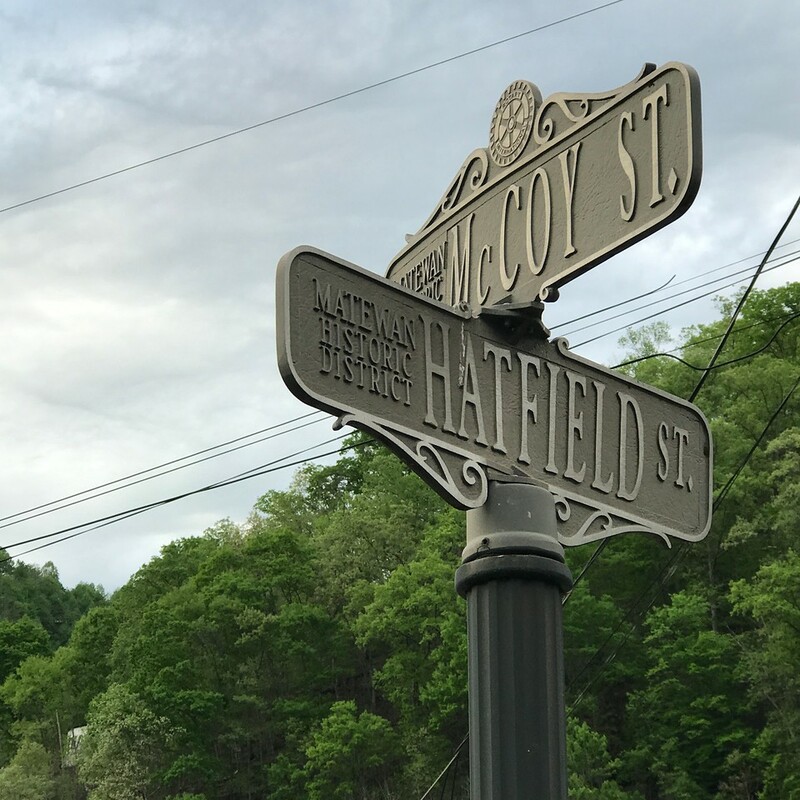 We parked for a few days at the Devil Anse staging area of the Hatfield-McCoy trail system in Matewan, West Virginia. The Harvey again looking tiny amidst the brutalist stylings of the flood wall and the hulking toy hauler. 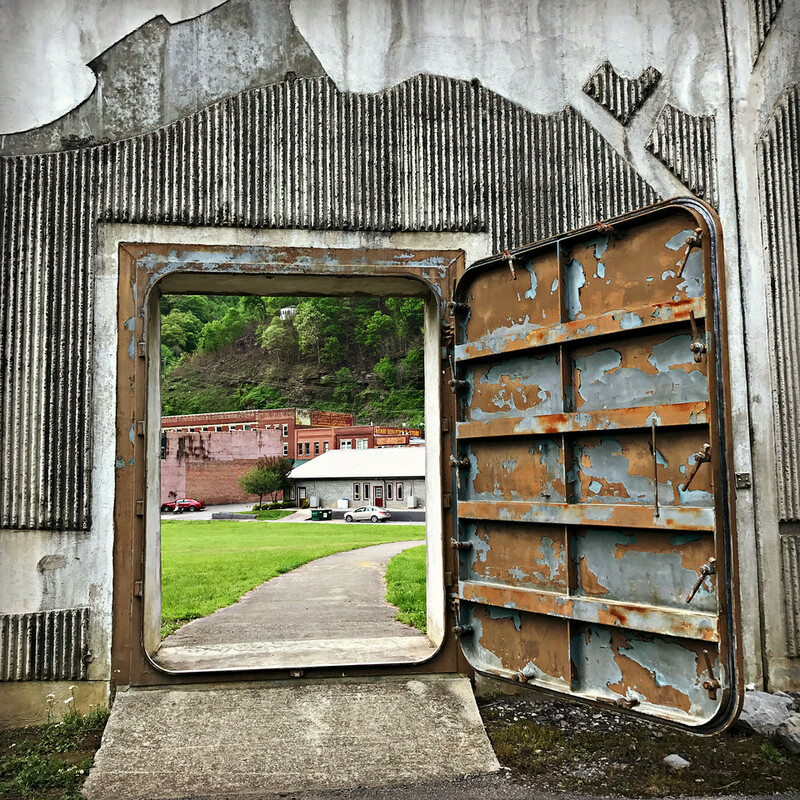 When you’re in town, you’re always aware of the wall. It had an interesting psychological influence. 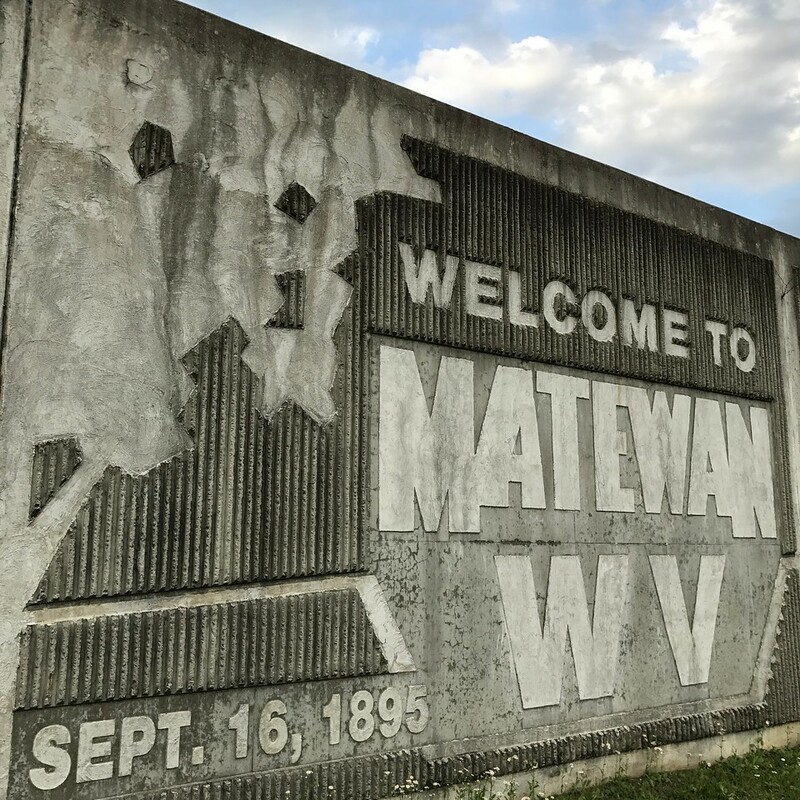 Matewan sits on the Tug Fork River. 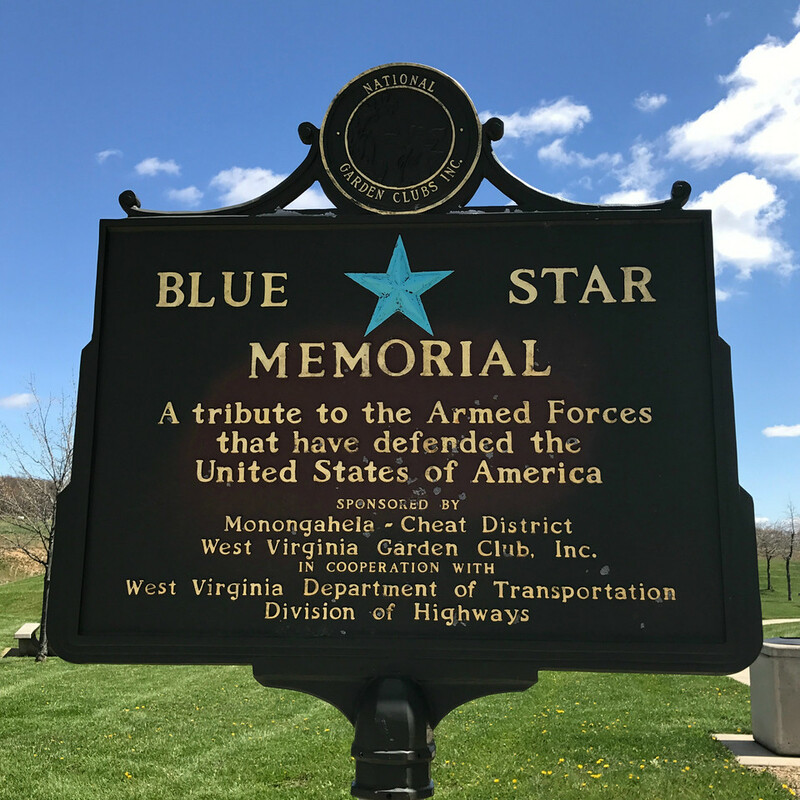 It creates a border between West Virginia and Kentucky. In the morning fog while the rest of the world was asleep I got to walk Lilo to Kentucky. I never imagined myself saying such a thing. Just goes to show you that life is continually full of surprises. 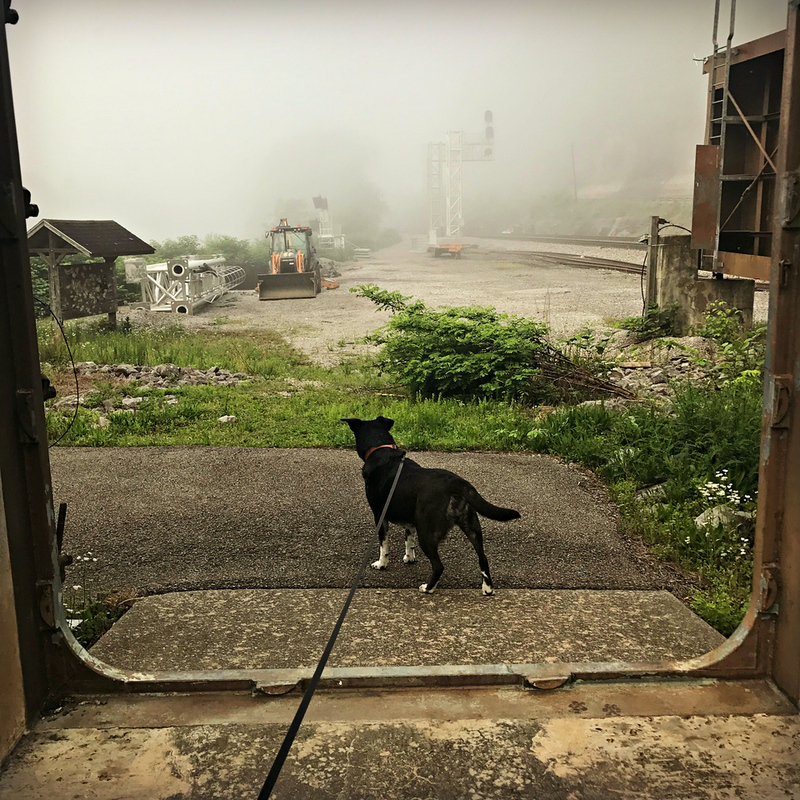 Lilo liked the railroad doings and activated her lead-weight superpowers whenever we were close by. This made no sense to me since she is terrified of loud noises. 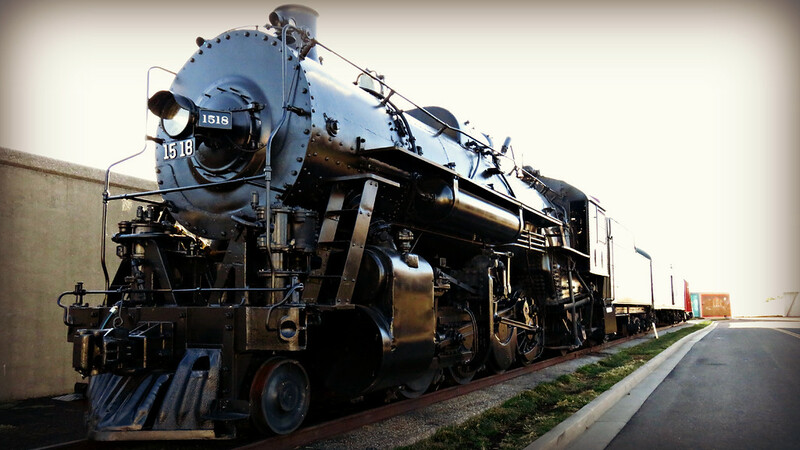 When the trains came squealing, clacking and honking through – she was unfazed. But set off the smoke alarm in the RV with BBQ grill smoke coming in from outside? It’s the end of the world. We’re all gonna dieeeeeeeeee! 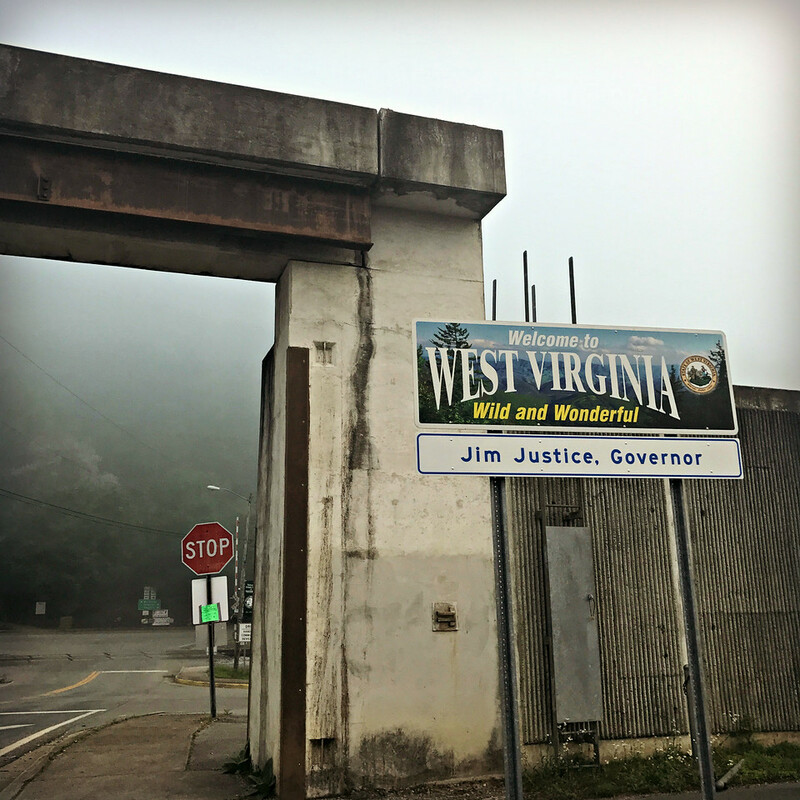 Foggy morning on the bridge, looking towards West Virginia and the Matewan flood wall. 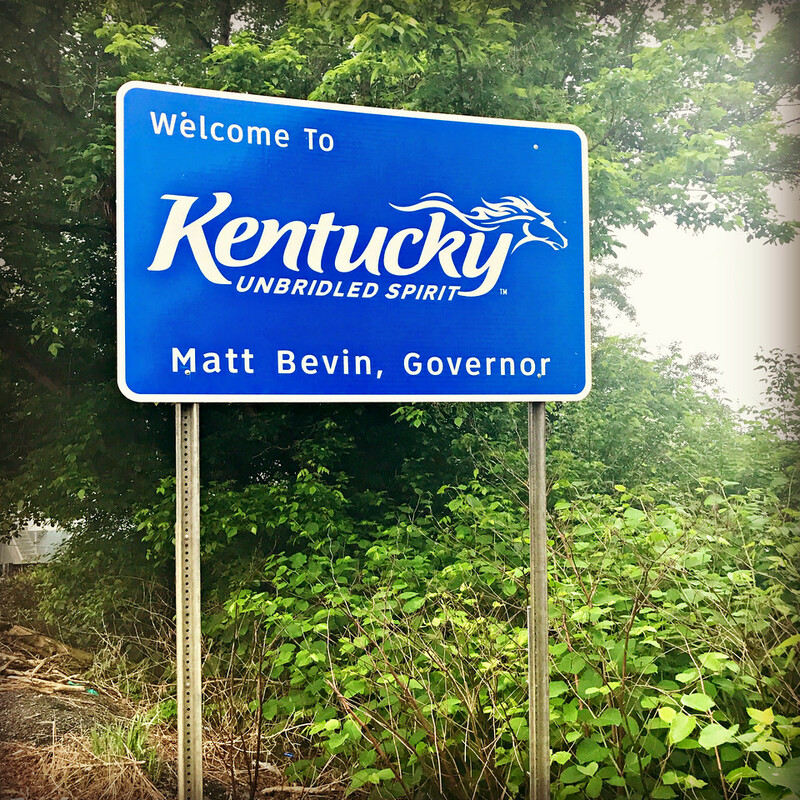 Something about that Kentucky logo makes me think of cigarette packaging. Weird. After my conversation with the woman who lost her home in the tornado, I finished packing up my bike and set off for the day. 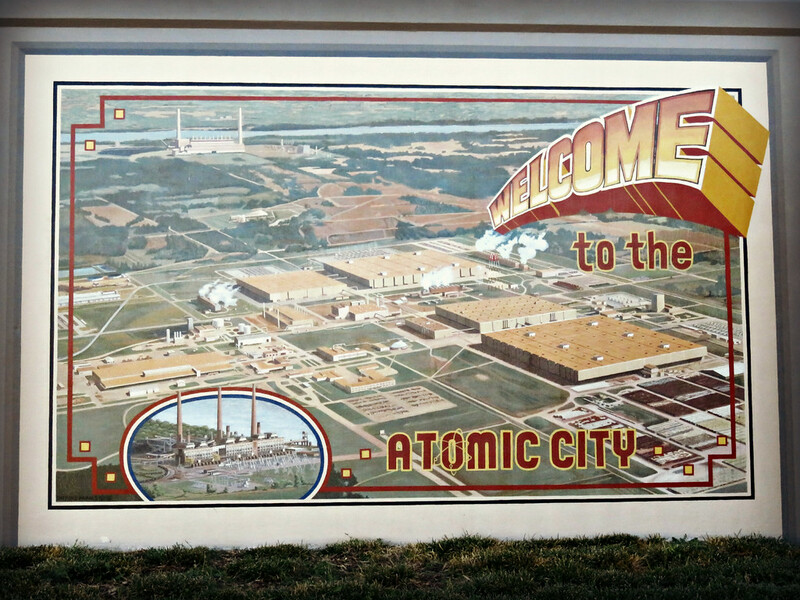 When I pulled up the waypoint listing in my GPS, one of the closest things to me was something called “Atomic City Mural.” To be honest, I had no idea what that meant. The entries in the dusty corners of my Zumo can be cryptic like that. Just because I have something saved doesn’t mean I have any idea what it means. Keeps life interesting. When I pick my way to whatever is on the other end of those coordinates it’s like a surprise party. Since I like to live on the edge, I pressed “go” on the atomic entry and was on my way. 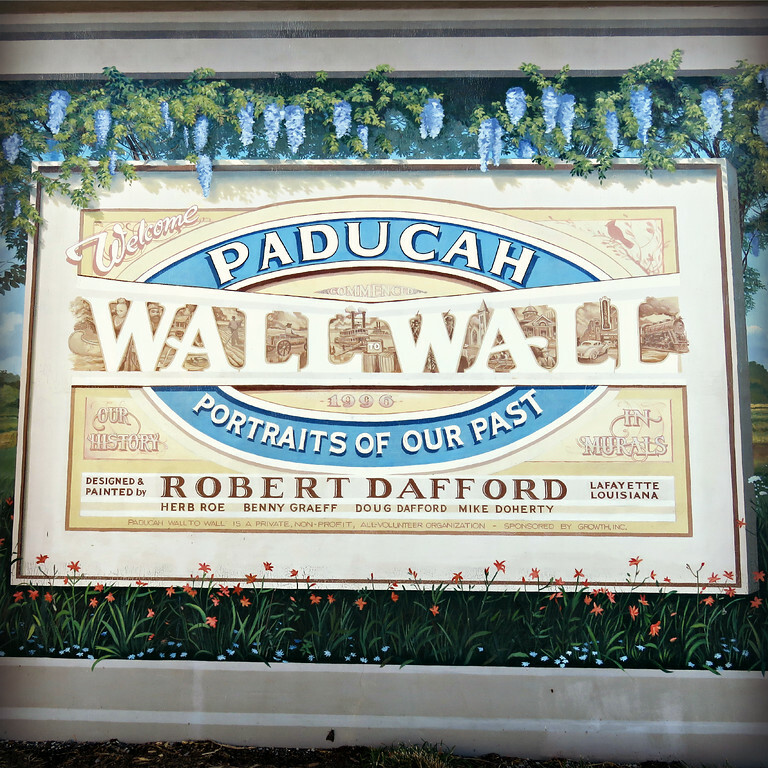 The nice lady in the box directed me to downtown Paducah, Kentucky. 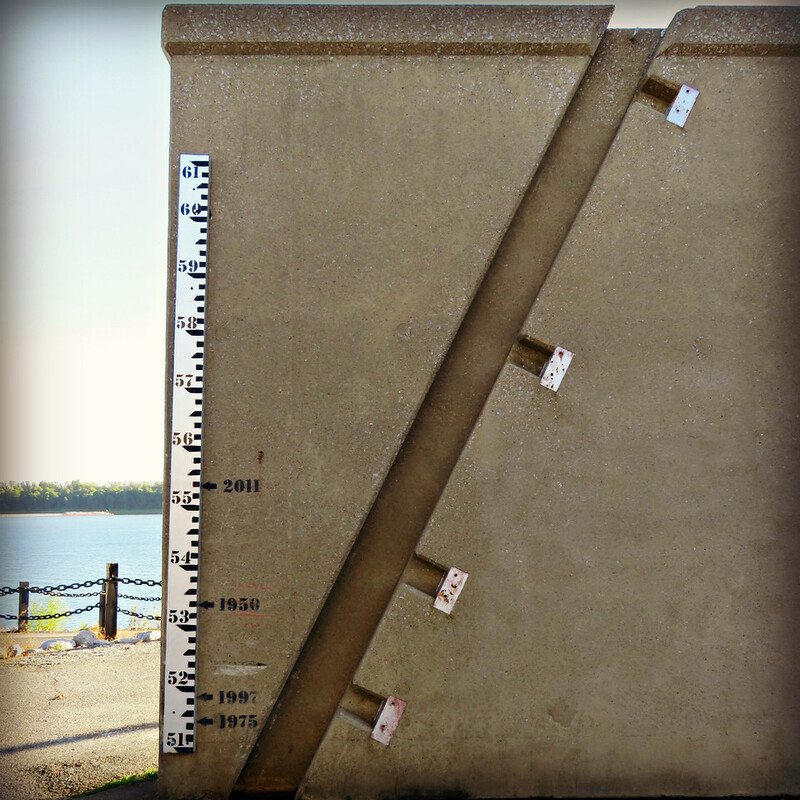 When I arrived at “…Atomic City Mural …on left” I was surprised to find a tall concrete scroll of artwork decorating the flood wall built to keep the Ohio River at bay. It was beautiful. 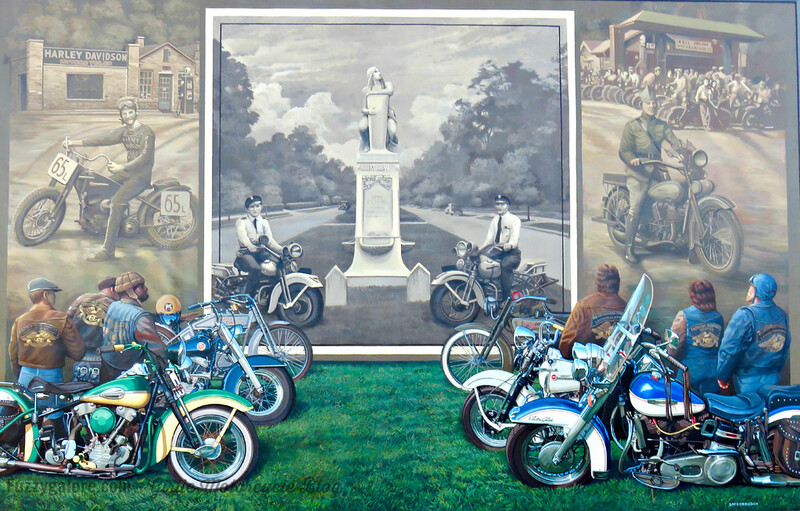 It did my heart good to see a panel proudly featuring motorcycles. 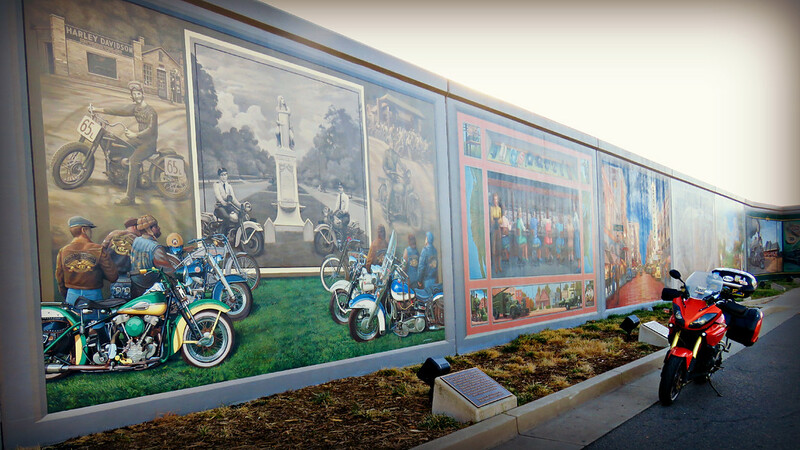 Here it is – The Atomic City Mural! 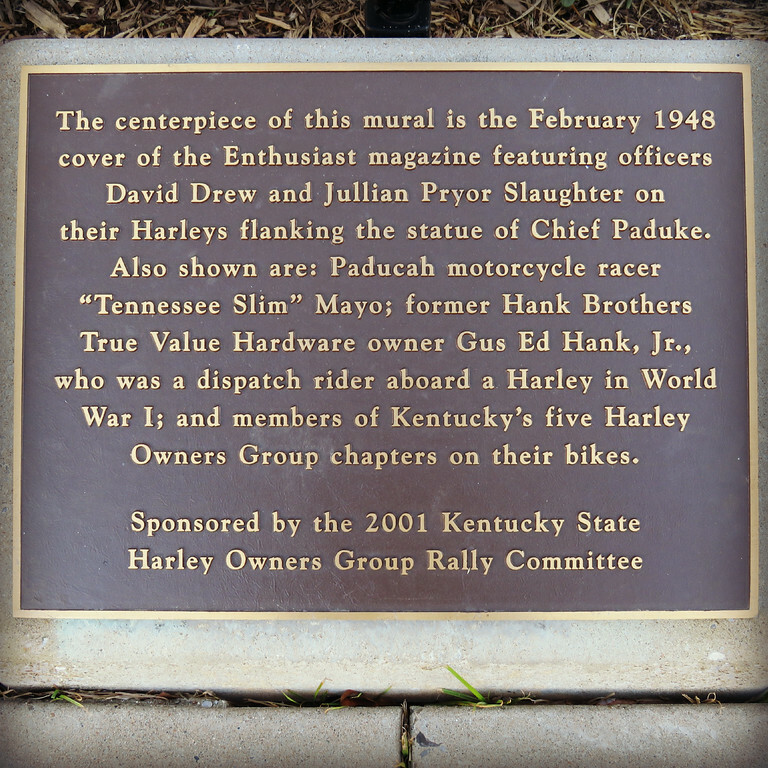 In the spring of 2009 our gang of friends who mostly participate on the esportbike.com motorcycle forum all converged on Morehead, Kentucky to do some riding in the Daniel Boone National Forest. One of our day rides brought us through the Nada Tunnel. This trip was especially exciting for us because our friend Pimmie who lives in Holland flew over to stay and ride with us. Side note: Apparently all of my friends are really tall. Do you wanna play Motorcycle Photo Blog-O-Rama? 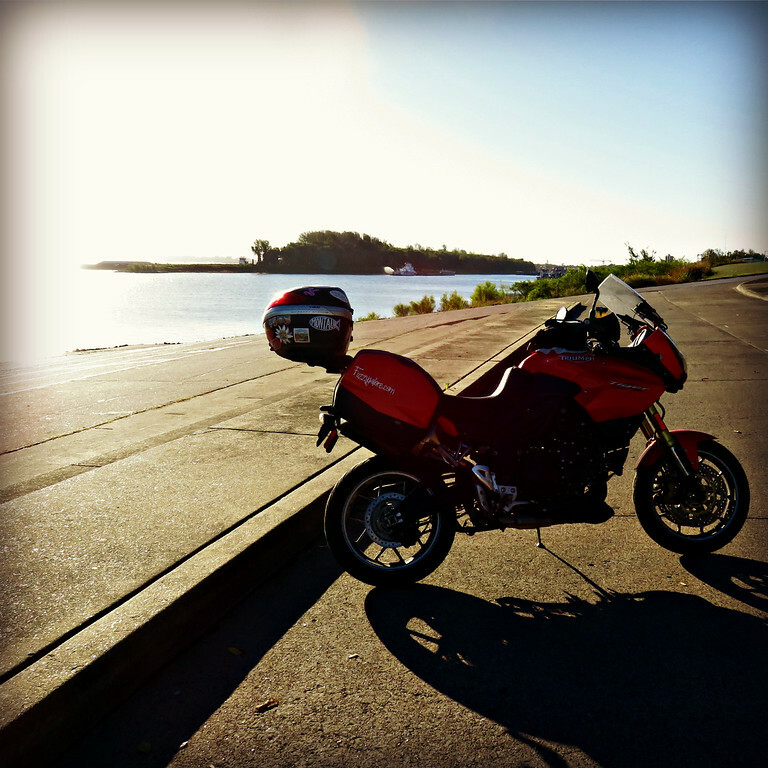 Post one of your motorcycle-related photos that suit this photo meme on your own blog. Caption or describe your photo. Tell us where and when it was taken. Maybe include an interesting note about it. Encourage others to post their photos! First things first. Meme, it sounds like team. Here on the web, a meme is a popular or contagious idea or theme. You know, like LOLCats, a bunny with a pancake on it’s head or sad Keanu. Make sure you leave a comment below so we can take a peek at your handy work! 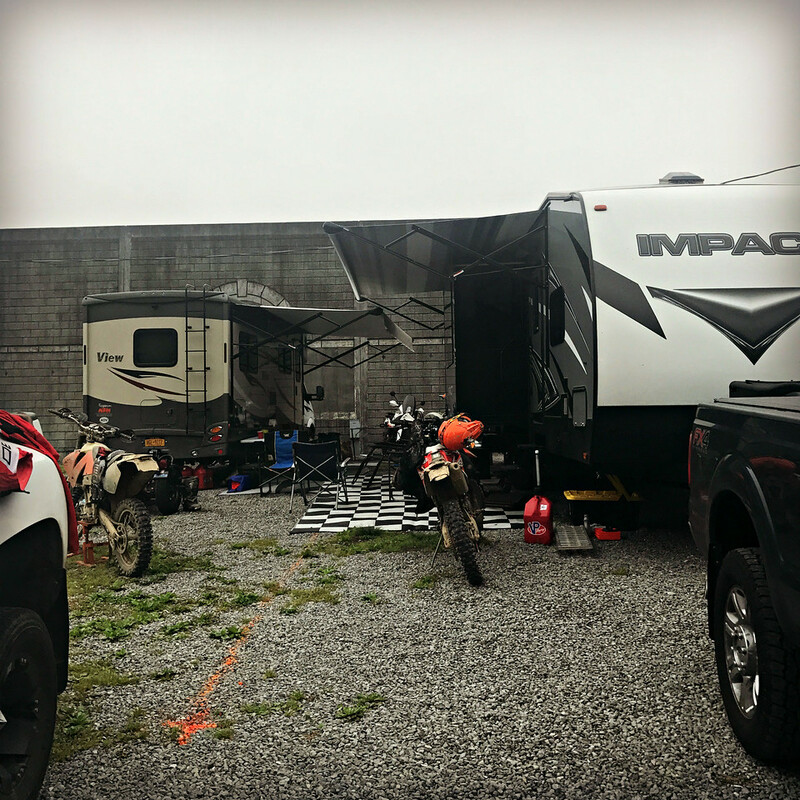 The motorcycle blogging community is rich with interesting characters that have a lot of useful information, compelling photos and stories to share. Sometimes we just need a little help finding one another. Similar to forum Tag-o-Rama type games, this blog photo game – an internet meme if you will – can give us a little push by helping us discover other blogs while posting great motorcycle photos at the same time. So open up that photo folder or better yet – get out and ride to find a photo that you think matches the Moto Photo Blog-o-Rama theme. Are you ready? Let’s play! 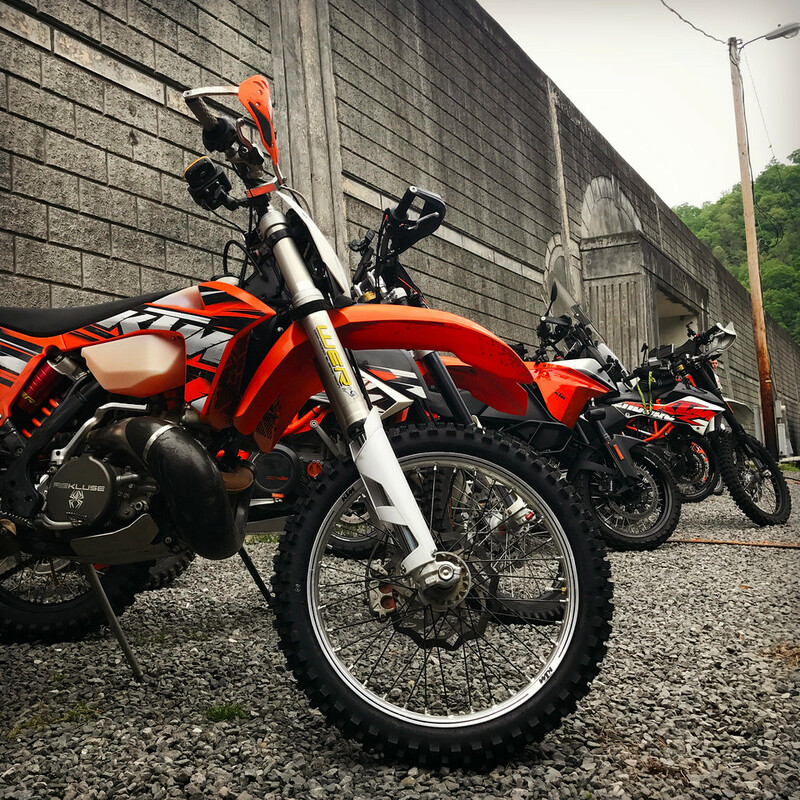 This photo of my BWM R1150GS was taken on route 1274 outside of Morehead, Kentucky in May of 2009. 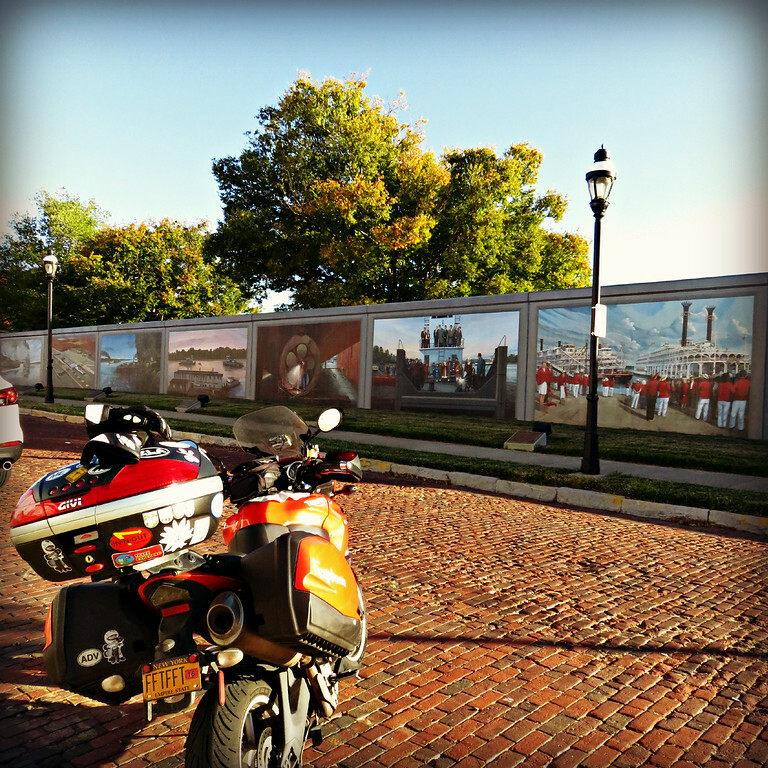 I slipped away for a quick solo ride in the early morning while the rest of the gang on the trip was still sleeping. It felt amazing to be standing alone on that road next to those towering rock walls. 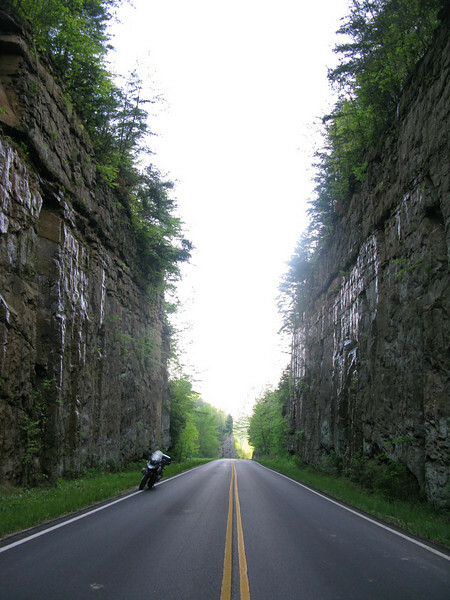 Kentucky’s Natural Bridge State Park was one of our day ride detours while we were staying in the big k-y. 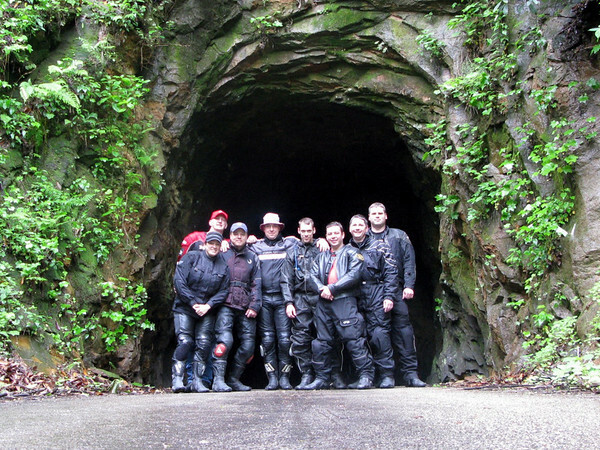 Not far from the Nada Tunnel, it only seemed right to include it on our ride for the day. Kenny takes in the view from atop the bridge. Lucky me 🙂 A great bunch o’ guys.